The posh decor and premium delicacies offered may have made Fortuna Palace Seafood Restaurant in Kajang seem a little intimidating to younger patrons. This has raised the concern of the operators, who feel that they need to bust the misconception. The Chinese restaurant is all geared up to lure the young crowd in various ways, including monthly special menus, modern food presentation and a cellar filled with hand-picked New World wines. Executive chef Oh Ah Poh is respected for his culinary mastery gained through 40 years of experience. He is always proud to have learned his skill from sifus who worked at the most famous restaurants in Petaling Street. On the other hand, he is a young-at-heart andloves to explore new things. Restaurant owner Datuk Low Chin Meng also often gives his input. With all these combined, patrons can be certain that they are in for a treat, one that is flavoured with creativity and sincerity. Kicking off the new special menu is Farm Duck Salad, which reminds one of Chinese New Year Yee Sang because of sauces used. This salad brings together five types of fruit, tossed with plum sauce, apple and pineapple jam, and sprinkled with shredded roast duck that adds a robust aroma and firm texture to the dish. With this dish, anytime of the year can be as joyous as the festival. Lobster Dragon Ball is a new way to savour the crustacean, and Low assures that the price is not as out of reach as one would think. “The price is almost like a prawn dish. Usually, lobster is either baked or served sashimistyle. This is a different approach that can retain the lobster’s natural taste,” Low said. 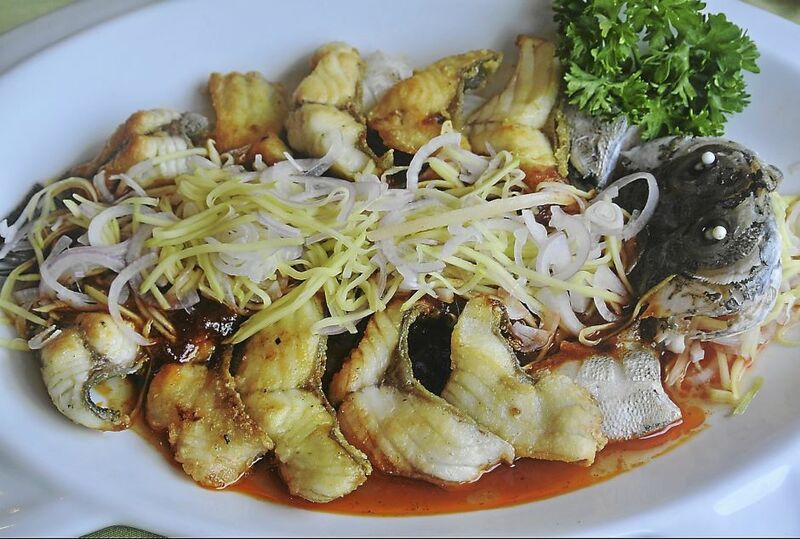 Exotic Taste Organic Jade Perch is a must-try as the fish is from the restaurant’s own fish farm in Broga. The price is thus about 30% lower than other restaurants. The Omega 3-rich fish has a firm, moist texture and served in a sweet, slightly spicy sauce. Mirror Pairing Scallop Plate is a dainty way to savour the chunky scallops. Half of the serving is pan-seared with a hint of wasabi while the other half is fried and served with potato shreds. Padi Field Crab is an unforgettable delight, attributed to the chef?s creative marriage of common ingredients such as lemongrass, screwpine leaf, margarine, ginger and crab. The moist, aromatic and flavourful rice transports one back to the pleasant simplicity of a paddy field, leaving behind a calming aftertaste. Triple Green Treasure Vegetarian Dish stands out with the use of water chestnut that weaves traces of light sweetness into the greens. Black fungus, kailan and golden needle mushroom make an unusual but harmonious combination that is also healthy. While the restaurant opens its arms to younger patrons, it is still the place for business associates to dine and wine. Double Boiled Refreshing Soup clears the palate and freshens up the mind with a dose of ginseng. Australian Wild Abalone and Fish Maw is the restaurant?s star item, wild abalone that is bigger in size offers a better texture while the soft and silky fish maw enhances the overall experience. The abalone has to be cooked for 24 hours for the sauce?s flavour to penetrate fully. Wines will add dimension to the meal, Low reckoned, and the restaurant’s selection was hand-picked by connoisseurs who personally visited the wineries in Australia. Again, Low stressed, they are reasonably priced so there’s no reason for younger patrons to feel intimidated.